My first synod assembly as an ordained pastor was in the oddly named town of Devils Lake, North Dakota. It was about a three hour drive from my home in Fargo, almost all of it through prairie land. At one point, it dawned on me that I was the only thing moving as far as the eye could see: no other cars, no people, no tractors, no livestock, not any birds…nothing. It was just me and the endless Dakota prairie. I knew I wasn’t lost, but it was deeply unsettling to be so alone. I imagine Noah and his family must have felt much the same thing. The 40 days of rain and floods must have been bad enough; the 150 days of calm which followed must have been worse. They weren’t lost, but they were alone. How terrible it must have been to look out on the endless ocean and know that they were the only people left alive, their ark the only moving thing. How sobering to realize that God had truly saved them from the flood. Prayer; Lord, open our eyes your terrible judgment of sin, that we might cling to your Word and flee to the ark of your Son, in whom we are never alone. Amen. Today’s devotion was written by the Rev. Dr. Eric Waters, Assistant Pastor at Upper Arlington Lutheran Church, Columbus, OH. Wonderful devotion. Reminds me of a statement attributed to St. Augustine who said that the church is a lot like Noah’s ark: if not for the storm raging outside, you could barely stand the stink. If it was in today’s setting, what do you think Noah’s wife and children were saying through all this? “Noah!Just what have you gotten us into here? Are you certain that you heard GOD speaking to you?” We are here to serve God through Jesus Christ and seek out HIS will for us. 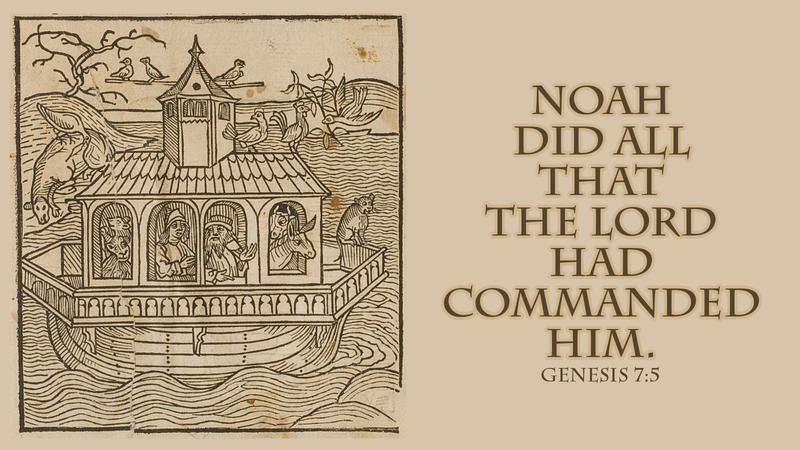 Noah had no trepidation, he did exactly what God had told him to do. I am confident that his sons helped him in building the ark in the midst of all the heckling they would have received. But they finished the task and lived. So, in that, why do we doubt and many times succumb to the heckling of those who don’t believe in Jesus Christ? Why do we not hear what God has to say to us? Are we too busy for Him?